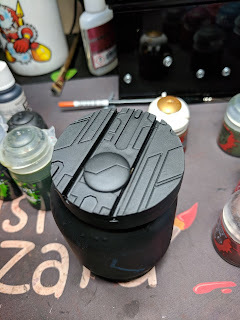 While I did post Sorscha for this week's Miniature Monday (because I couldn't wait to share it), I might as well share the making of the plinth. 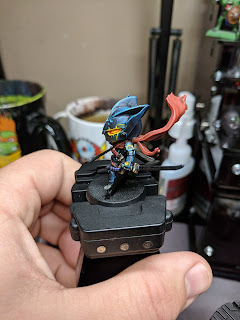 I've been playing with resin for awhile now, but after doing the Kastelan Robot heads I fell in love with casting. I've had multiple ideas for making replacement parts on models with clear resin, plinth ideas and parts for terrain. As I mentioned last week, I found a nice hunk of wood for the plinth and decided to change it into a chunk of ice, since Sorscha is all about ice magic. Plus, I can't take her to GenCon with her stock plinth, I needed something much more interesting and impressive. 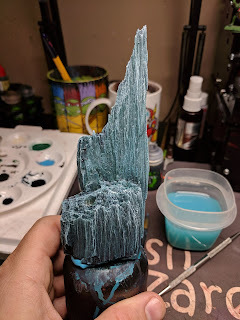 Thanks to a couple 1 lbs silicone mold making kits, I was able to make a mold for this massive piece. I possibly could have done it with a smaller mold, but its all a learning process and eventually I'll become more proficient in mold making. After I had poured the resin, I grew super anxious about the bubbles in it. As I don't have a way to vacuum cast, I had to keep an eye on the bubble situation. 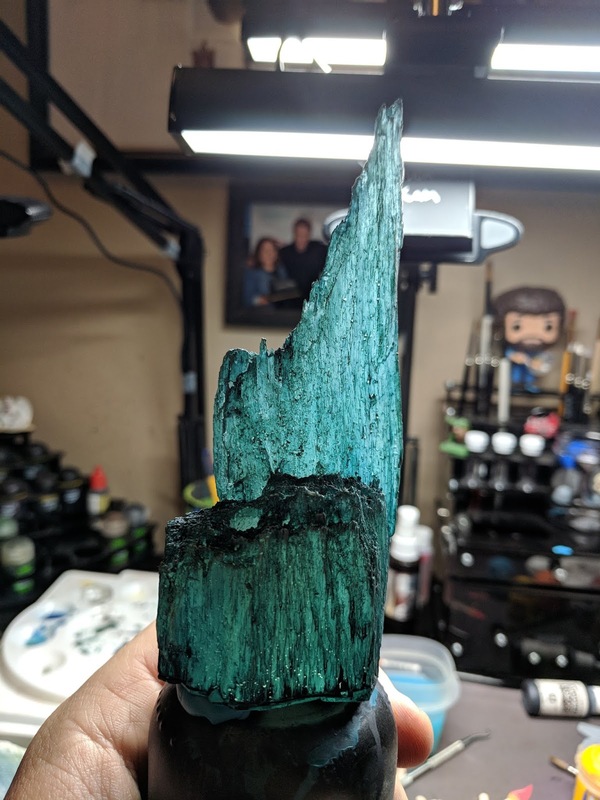 There seemed to be a lot of them along the sides of the mold and I was worried that it would going to ruin the look of the finished piece. I also knew that I only had one shot at this mold, as removing the original was a chore and a half. When it came time to remove the casting, I'd need to cut it out of the mold. After a day of waiting for resin to cure I finally cut it out of the mold and was honestly surprised by how well it turned out. 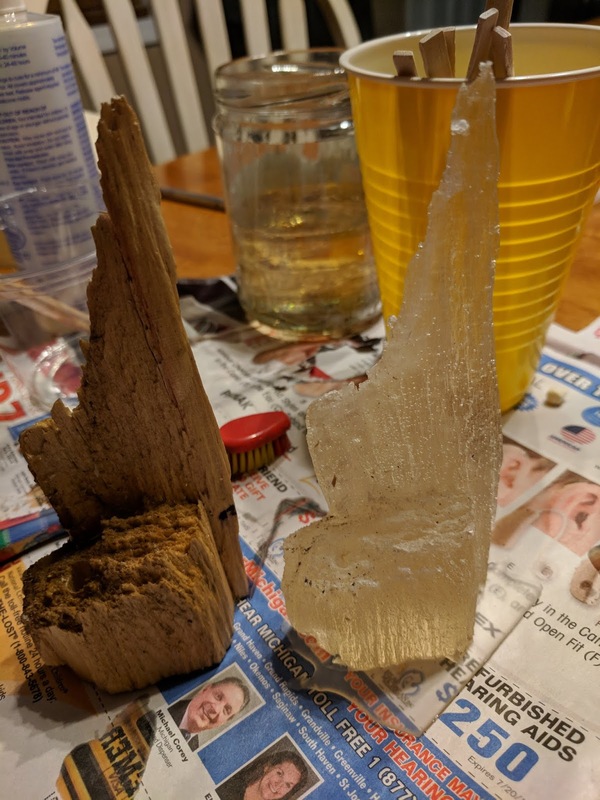 There were a bunch of pieces if silicone that stuck to the resin and needed to be cleaned before I could add paint to it. 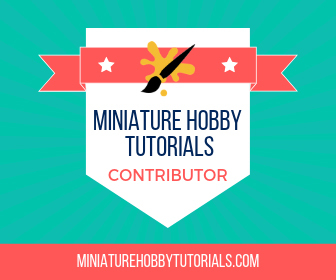 When I started painting, I began with a "primer" coat of Testors Dullcote. I then used some washes and paint to give it its coloring. I'm really pleased with the end result and when the light hits it you can see that it's nice and translucent still. Work on Takata continues. He's been slowly getting further along. As of Monday he's nearly finished with painting. His armor is all finished and now all that's left is the swords and scabbards. To add a little more visual interest to him, I decided to paint the wraps on the sword handles different colors. I'll likely be painting the scabbards different colors as well. But for now they are all basecoated with Rhinox Hide. I need to look at some examples of katana with their scabbards and see what I like. I have some ideas though. I've been struggling with his base for a long time. Originally I wanted to have him standing on a catwalk in front of a holographic billboard, using clear resin to cast my own billboard. But that idea never took shape. I had a few other ideas too, but nothing really grabbed me until I saw the movement and range finding tools for Star Wars Legion. After a bit of cutting and copper tube, I had a nice sci-fi looking base! I still need to decide on color, but I'm leaning towards a blue-grey with some colored recesses. Either orange or blue. I'm sure it'll all come together and I'm just being indecisive because I have a deadline. But it'll all shake out. That's it for this week. This will likely be my last Wizardry in Progress before GenCon hits, as I'll be traveling Wednesday morning next week.